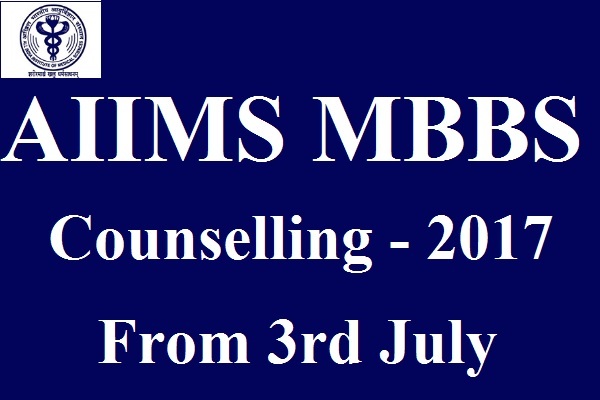 AIIMS MBBS 2017 Counselling: All India Institute of Medical Sciences is going to conduct Counselling from 3rd July 2017 for the candidates who have qualified in MBBS Entrance Exam. It has conducted the entrance exam on 28th May and released the results on 14th June 2017. Concerned officials will conduct AIIMS MBBS 2017 Counselling to fill 707 vacant seats in seven AIIMS. Candidates can check All India Institute of Medical Sciences MBBS Counselling Schedule from the official website www.aiimsexams.org. It has increased the total number of seats from 700 to 707, and the increased number of seats is in AIIMS Delhi for foreign candidates. For the first time, it is providing admission to foreign students who have cleared MBBS Entrance Exam. Firstly they will conduct AIIMS MBBS 1st Round Counselling for General category candidates followed by reservation category candidates. All Institute of Medical Sciences was established in the year 1956 at New Delhi, India. Every year it conducts various entrance exams for undergraduate and postgraduate courses. It will conduct common counselling for all the seven AIIMS. We have uploaded the link of AIIMS MBBS Counselling Schedule 2017 at the end of our page. AIIMS MBBS Open Counselling Call Letter is uploaded on its official website www.aiimsexams.org. Those who have qualified in the entrance exam have to report at the counselling centre with all the necessary documents. AIIMS MBBS 2017 counselling for all 7 AIIMS will start from 3rd July 2017 (8:30 AM) at AIIMS, Delhi at J.L. Auditorium.